We’re pleased to bring you this exclusive interview with up-and-coming dream-pop outfit, Trails And Ways! The band is stationed in California’s Bay Area and have been making waves with their song “Nunca” (which you can stream at the end of the interview), impressive cover of M83’s “Midnight City”, and entertaining live shows. 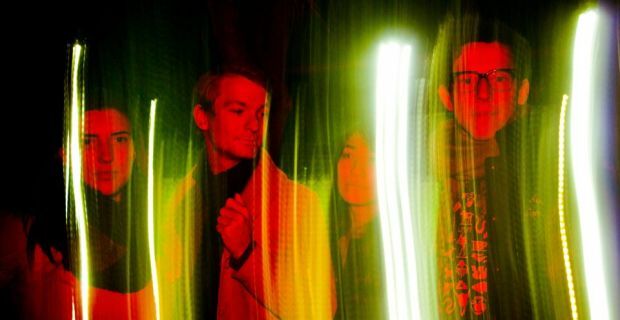 UTG had the chance to speak with guitarist/keyboardist “KBB” about what we can expect from them this year, being compared to Beach House, and rock climbing. Read through to get the scoop on Trails And Ways, a band you’re sure to be hearing a lot about in the coming months. “Nunca” is getting a huge response. Is the song featured on an upcoming release? Definitely. “Nunca” is the second single for our album Trilingual, which we’re aiming to release late this year. What influences go into your writing process? Jorge Ben Jor, Mount Eerie, Agnes Varda, The Radio Dept., girls, Girls, Theodor Adorno, John Ashbery, boys, men, Boyz 2 Men, João Gilberto, Top 40 radio. What are your favorite things to do in the Bay Area? Ian and Emma are way dedicated surfers. I like to volunteer when I can with the rad social justice groups out here, and climb rocks. Hannah plays violin with like 20 bands and just built a gorgeous wood table. If you could play one of the more popular, large music festivals, which would it be and why? Sasquatch; cause I grew up down the river. Also Ian wants to play Woodstock with Hendrix and I haven’t told him yet that it’s canceled. Marcos Valle, John Maus, Active Child, Grimes, The Weeknd. How do you feel about being so closely compared to Beach House? Terrific, and like it’s pretty unfair to them. What does the band like to do after you play a show? Take the other bands to a taqueria and take detailed notes on the show in our band diaries. Also hug. Also, to clarify, we each have our own band diary that are identical but in different colors. What’s your favorite music related show on television? The Old Grey Whistle Test. Ian likes Dancing With The Stars with his mom. Emma grew up in the countryside and I don’t think has figured out the TV yet. Hannah likes Tom Petty videos. What bands would support you on your ideal/dream tour? Support us?? We’d love to share a tour in any position with our pals Wild Ones, Waterstrider and The Bilinda Butchers. Dream of opening for Toro Y Moi, M83, Gardens + Villa, Active Child, or especially tUnE-yArDs. What can the world expect from Trails and Ways in the near future? A video, a split covers 7″ with a rad New York band, and a rock climbing love song. How did Trails and Ways come to be? We all knew each other and mostly lived together in the student co-ops/cults/communes at Berkeley. After graduating, I was doing research in Brazil and fell hard for the words and the tunes, and came home to California full of little bossa nova songs. As soon as I started playing one for Ian, on the spot he started building it up with beats, harmonies, texture. Emma and Hannah came in to record for our second EP, and realized we all just wanted to be together forever.